Are you interested in losing body fat, improving your strength, feeling better and looking better? How about accomplishing all of this in half the time of your typical workout routine? Well, you’re not alone. Look no further than High Intensity Interval Training (HIIT). High intensity interval training is alternating between high and low intensity exercise or between high intensity exercise and a short period of rest. For example, a short sprint up a hill followed by a walk back down, repeated multiple times is HIIT. Burns fat, not muscle | It’s effective for losing body fat while retaining lean body mass. Improves multiple aspects of fitness | It’s a great method for strengthening the cardiovascular system and muscular system at the same time. More efficient | HIIT training is very efficient. A typical HIIT session is 4-20 minutes versus the standard 30-60-minute steady-state cardio routine. Easier on the body | HIIT training session is a lot easier on the joints because total training time is much less. There are many ways to do HIIT. Whichever method you choose, just remember to alternate short bursts of high intensity with periods of rest or low intensity. Using bodyweight based exercises in a circuit can be a very effective form of HIIT. Work for 20 seconds on each station with high intensity and good movement control and then rest for 20 seconds. Do this four times at each station before moving to the next station in the circuit. Rest 1 minute between each station. When you have finished the last station in the circuit you have finished your first HIIT workout. 20 seconds of work / 20 seconds of rest / 4 times each station / 1 minute rest between each station. Disclaimer: “high intensity” means high intensity for YOU. If you’re a beginner, a fast jog or uphill walk for 10 seconds is a better start than trying to handle an all-out sprint workout. If you’re at all unsure if this is appropriate for you to perform, please consult your doctor before attempting this or any HIIT workout. Safety first! Don’t forget: Perform an adequate warmup and cooldown when performing HIIT such as dynamic stretches before until warm and static stretches after your workout. 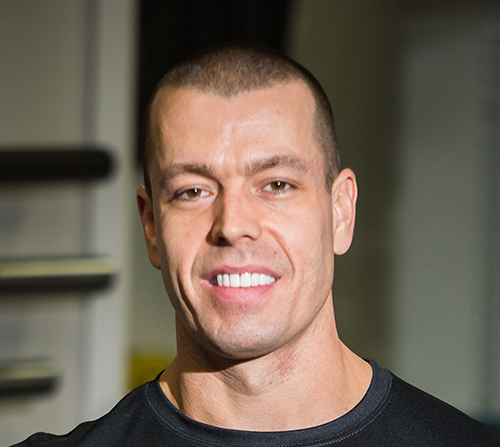 Aaron Gilbert, CSCS, is founder/owner of Longevity Athletics.